November is not immediately thought of as the ​best time of year to visit Rome since that's when the ​weather starts to turn chilly, and it can rain. Although Rome is popular with tourists year-round, November is a month when the Romans often have the Eternal City pretty much to themselves. It's a good time to enjoy the theater and concert season, as well as several religious observances. On this public holiday on November 1, Italians remember their deceased loved ones by visiting graves and cemeteries. On this solemn occasion, many Romans visit local churches for special observances and visit the city's famous Roman catacombs, the underground tunnels where the citizens of ancient Rome were buried. All Souls Day on November 2 is not an official ​​Italian national holiday, but it is also observed by Italians who bring flowers to the cemeteries. For more than 40 years, this festival of jazz concerts is held in Rome's Auditorium Parco della Musica, usually during the first week of November. The week-long celebration of jazz offers something for everyone, featuring Italian and international jazz stars serving up an eclectic mix. Past artists have included vocalist Gregory Porter, the Dhafer Youssef Quartet, and Australian Grammy-winner Sarah Mckenzie. On three Sundays in November you can attend free music performances at the Teatro di Villa Torlonia. Throughout the months of October and November, the Romaeuropa Festival presents cultural events at various venues in Rome. The extensive program includes contemporary music concerts, inventive dance performances, and live theater presentations. From the end of October through the first week of November, the Rome Film Fest hosts international film screenings, panels, classes, and other cinema-related events. The complete lineup is announced to the public via the press in early October. Just one of many Italian film festivals, this one has, in the past, featured big-name Hollywood directors such as Wes Anderson, Jonathan Demme, and Martin Scorcese as well as many Italian and international directors and actors. Events are held at the Auditorium Parco della Musica and other venues throughout Rome. On November 22, Romans celebrate a local favorite saint, Cecilia, the patroness of musicians. Her feast day is celebrated at Santa Cecilia church in the ​Trastevere neighborhood of Rome, as well as at the Catacombs of San Callisto. 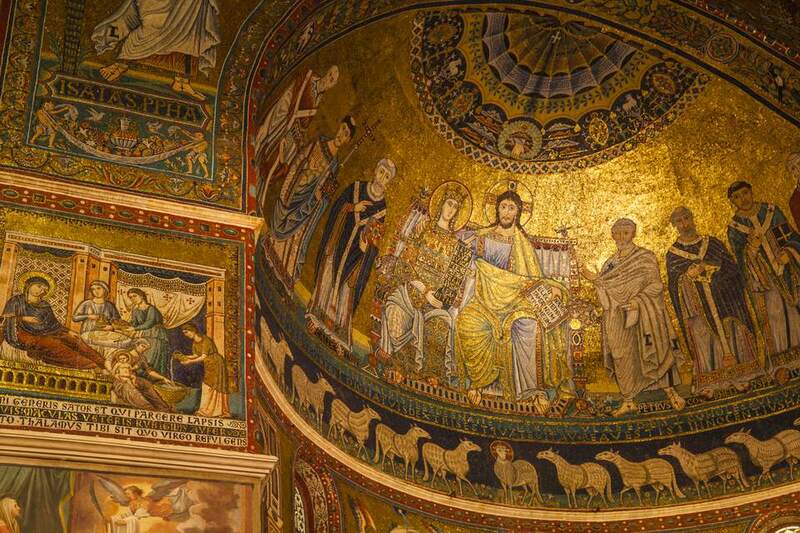 The 9th-century church in Trastevere is said to have been erected on the site of the home of Cecilia, an upper-class woman who lived in the 3rd century. The church contains a beautiful fresco by Cavallini and a moving statue of Saint Cecilia by Stefano Maderno. The church is open to the public year-round.